If you’re anything like me, the holidays come with a lot of joy but also some unwanted stress. I love giving gifts, but I want my gifts to be meaningful and not just clutter up the recipient's home or life. That’s why I created this list of gifts that follow our family’s values- Creativity, Health, Affirmations, Reading, Meditation, and Service. If you’d like to create a holiday season with more fun and less stuff check out the Holiday Wish List Registry at SoKind.Org. Give the Gift of Creativity- I love getting creative for the holidays. Personalized gifts require thought and often time to put them together and are generally more meaningful than something you pulled off a shelf at the mall. I love to make Christmas photo books for my family members using Shutterfly. Another fun idea is to make your family members customized coupon books. They make great stocking stuffers ;) To make these gifts truly customized, make them with the recipient’s love language in mind. To find out your child's love language take this quiz, this one for a teen or this one for you or your spouse. Give the Gift of Health- Health is so important! Are your kids are involved in many activities throughout the year? Why not hit up the grandparents or other family members to help chip in! Tyler recently started baseball lessons, so I put it on his Christmas list. Now Grandpa can help pay for them (especially since it was his influence that got him into baseball in the first place ;). Does your child take dance lessons or practice Tae Kwon Do, do they play soccer or another sport? For the holidays, ask for a gift card to help offset the cost of these activities. Sports equipment is another great gift for the athletes in the family. Do you have any busy moms on your list or need an idea for yourself? Give them the gift of knowing “what’s for dinner?” with a gift box from Hello Fresh. Give the Gift of Affirmations- Affirmations were the hardest habit for me to start when I was new to The Miracle Morning. Luckily, we can borrow others affirmations until we are ready to create our own. 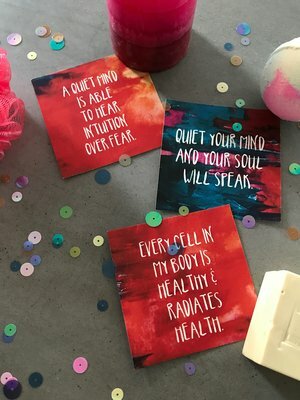 I personally love these affirmation cards from Fringe & Fitness. They are simple and beautiful and you can leave them right by the bathroom mirror to remind yourself of how truly amazing you are! If you have a kid that loves to color on your list, check out The Miracle Morning Art of Affirmation Coloring book. It’s the perfect gift! They get to color while they fill their heads with positivity. Add in some awesome markers and you're sure to have one happy kid on your hands. Don't forget about musical affirmations! My good friend, Jeremy A.K.A Brotha James, sings uplifting songs with affirmations built right in. Check out his first CD called Animal and in early 2018 keep an eye out for his new album! Give the Gift of Reading- I love to teach my kids through reading together! Did you ever wish there was a service where you could input the values you want to teach your children and it would give you a list based on other like-hearted parents experiences with those books? Well, now there is! It’s called The Intentional Book Club. Check out this blog post about all the wonderful benefits you will get for under $10 a month! Don’t have time to read? Ask for a subscription to Audible and listen to your books, like I do. Give the Gift of Meditation- Kids do not have the same attention span as adults (typically). They do, however, have the ability to focus and with practice, that muscle can get stronger. I like to use props with my kids to give their brains something to focus on. One of my favorite props is a Hoberman Sphere to help them focus on breathing. As they breathe in, have them expand the sphere and when they breathe out collapse the sphere (or you can do it for them and the follow along). Another great tool I’ve found is the book, Nursery Rhyme Meditations by Dr. Taylor Moore O’Shea. This wonderful book has several meditations you can read to your child to guide them. I love the rhyming flow of the meditations and all I have to do to guide my kids is read! No previous knowledge of meditation necessary. Give the Gift of Service- Do your kids already have enough stuff? Give them the gift of giving this season. There are plenty of families that do not have enough this holiday season. Work together to make desserts for a local homeless shelter, adopt a child or family from a church or other charity organization. Give money in honor of the people on your list. Two of our favorite organizations to support are The Front Row Foundation and 1Life Fully Lived. This year instead of asking for birthday presents, the kids and I are asking for donations to The Front Row Foundation. Facebook now makes it really easy to set up a fundraiser of your own. Watch this video to see just one of the reasons we love The Front Row Foundation! I’m grateful that the holiday season is upon us and that this is a time of traditions and family togetherness. I’m grateful for the ability to give generously throughout the year and I’m able to help those in more difficult circumstances than my own. I’m grateful to you and wish you all the blessings this season has to offer. I love to connect with my readers. Please join the conversation with other like-hearted parents in our Facebook Community.